Prior to moving to private practice, Adrienne had extensive experience working within government, NGOs and private organisations in the areas of unemployment, rehabilitation, health and education. She has had 4 private practices in 3 states. She has been with Riverlands Therapy Services since 2008. Adrienne now chooses to work exclusively with the post school-age population, adults from the age of 18. 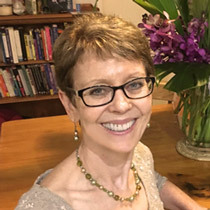 Adrienne uses evidence-based strategies from Mindfulness Based Cognitive Behavioural Therapy (MBCT), Solution Focused Therapy, Interpersonal Therapy, Acceptance and Commitment Therapy (ACT) and Schema Therapy. She sees clients with anxiety in all its manifestations (social, performance, OCD, generalised anxiety), mood disorders (including depression), life stage transitions, relationship issues, and grief and loss. She has a strong organisational psychology background which assists in her work with clients referred under Work Cover. She has been contracted to various organisation to provide Employee Assistance Programmes (EAP) and provides professional supervision to individuals in a range of professions. Adrienne works in the Penrith office.